Anita has been working as a psychotherapist since 1981. She trained in integrative psychotherapy with a particular interest in transpersonal psychology and the work of Jung. Anita works with individuals, couples and groups both in the UK and in Sweden where she works for and facilitates many training groups at the Psykosyntes Institutet in Gothenburg. 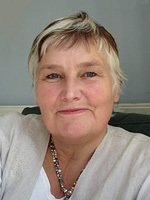 Previously to this Anita worked in occupational health and trained in holistic massage and homeopathy. Anita has presented many workshops and seminars to both statutory and non statutory agencies. Together with Judi she also facilitated training groups in Budapest, Hungary on behalf of the Hungarian Gestalt Inst. Anita has a wide raging level of experience within the field and brings considerable enthusiasm, energy and skill to the London Diploma.